Bakson's Sunny Herbals Akne Aid Soap Reduce Inflammation & Infection of Skin, Removes Excess Oil & Reduce Acne. Enriched With Witch Hazel, Echinacea, & Tea Tree oil. 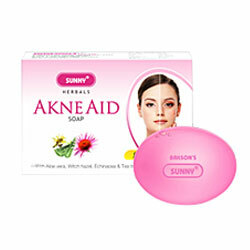 Enriched with Tea tree oil & Echinacea Akne Aid Soap helps reduce inflammation and infection of skin. Witch hazel removes excess oil & sebum thus reducing Acne. Aloe Vera moisturizes and revitalizes skin. Regular bathing with this soap is a natural way of rejuvenating and keeping skin Acne free.